A mural of a mermaid in the process of skeletonizing greets customers. In the bathroom, a taxidermied pheasant takes flight over the toilet. ¡Duino! (Duende), the Burlington restaurant connected to Radio Bean Coffeehouse, both physically and by owner Lee Anderson, has personality to spare. However, when ¡Duino! (Duende) opened in November 2009, the flavors of its “global street food” rarely matched the promise of its décor. Though the fare always sounded appealing, over several visits I consistently ended up with bland, brown versions of lamb kebabs, fries and crêpes. I loved the idea of ¡Duino! (Duende), but the execution was never quite right. In December 2010, a new chef joined the team. Cordon Bleu-educated Nathaniel Wade had been sous-chef at the Bluebird Tavern since its opening and a major influence on the cuisine at the popular gastropub. I wondered if he could bring ¡Duino! (Duende) to the level where I pined to see it. Two recent visits revealed that, in many ways, he has. A glance at the menu, decorated with photos of a masticating Che Guevara, showed that dishes are now listed as appetizers, small plates or large plates. Previously they formed a single long list, making it hard to anticipate the size of an order. We ended up with the Dilly Bean Martini. The drink itself brought to mind Japanese fashion designer Issey Miyake’s signature fragrance — clean with a hint of sweetness. The four dill-pickled green beans speared on a toothpick contributed a vinegary, herbaceous aroma that broke up the otherwise austere beverage. Though Wade has added more local products to the roster at ¡Duino! (Duende), prices have stayed admirably low. The most expensive item is the $12 fish and chips. Diners seeking ethnic food may not be inspired to lie back and think of England, but the beer-battered tilapia had an authentic taste of place. The fish yielded pleasingly when it was bitten, and the batter tasted just boozy enough, without excessive grease. Though the cole slaw was nicely vinegared, and the tartar sauce suitably tangy and creamy, I couldn’t help wishing I had mushy peas and rich malt vinegar instead. The side of fries was a point of contention at my table. Though they tasted salty and nicely caramelized, I found them soggy. My dining partner thought their texture was perfect. On my first visit, a pair of Thai dishes got their balance of flavors just right. Som tom, a slaw of green papaya, carrots, cucumbers and daikon, was pickled to crispy perfection in sweet-and-sour mango-lime vinaigrette, with more spice than one might expect in that particular salad. Savory peanuts softened the overall effect. Even better was the $7 bowl of peanut noodles. Wade has a yen for these: In an interview with me, he confessed that, in the days of Five Spice Café, he ate peanut noodles there almost weekly. His own cold noodles hit the spot for me in a way Five Spice’s never did. The dish was an ideal mix of the round, umami flavors of peanut and sesame; a touch of heat from liberal use of raw ginger; and the tangy and slightly sweet tastes of pickled onions, cucumbers and carrots. The best part: Even though I shared the noodles, there were more than enough left over for a hearty lunch the next day. The success of the first visit primed me for the second. This time we tried cha siu pork buns, which tasted good but initially left me a little confused. Here the Chinese dish, usually a steamed bun stuffed with pork, was served more like a slider. The chewy, challah-like bread was sliced in half and filled with hoisin-glazed pork belly and homemade kimchi. The belly’s fat was slightly crunchy in places, but, paired with the comforting bun and spicy preserved cabbage, the pair of sandwiches was still a successful Chinese-Korean fusion. Middle Eastern-style baharat chicken wings were huge and meaty. The sweet orange-and-date syrup combined well with the aromatic Turkish spice rub, which had strong notes of cloves, allspice and cardamom. Unfortunately, the grilled meat was so charred that it was sometimes difficult to taste the delicate flavors. One of the best things about this chicken dish was the small side salad of tomatoes and pickled eggplant. The tomatoes were almost disturbingly red and juicy; even at the height of summer, it’s hard to find such delicious specimens in Vermont. The pickled eggplant had a fun, toothsome texture reminiscent of dried apples. The same salad came with the Mediterranean plate, a $9 tasting platter that caused my dining partner to remark, “This is a great place to go on a date if you’re in college.” The inexpensive dish was perfect for sharing, with a pile of fresh pita triangles, a pair of salads and three dips. We couldn’t resist starting with the falafel. The chickpea balls were slightly green inside from the chopped herbs; one contained a whole clove of fried garlic. Appropriately rustic, the Israeli spices made for an aromatic bite. However, I wished for a tad more acid in both the falafel and the homemade hummus. That note came in the form of smoky, silky baba ghanoush. Bursting with lemon, the mashed eggplant made a wonderful foil to the earthier flavors on the plate. I would have expected the tzatziki sauce to do the same, but it was surprisingly mild. However, the only real loser on the combo plate was tabouleh, which didn’t taste like it had been seasoned or dressed at all. The Boyden Farms grass-fed beef cheeseburger had the opposite problem. The beef was cooked to an exact medium rare and tasted delicious in a coat of sharp Grafton cheddar. Unfortunately, a layer of special sauce drowned out the burger’s more subtle delights. The menu’s other American dish more than made up for the burger’s shortcomings. I can’t remember when a meal as simple as Wade’s chicken and waffles has given me such pleasure. Picture a light, eggy waffle bathed in honey butter so viscous it rivals the consistency of movie-theater popcorn butter. Amazing, right? It got even better with the addition of juicy chunks of fried chicken with a crispy, flaky coating and a topping of scallions. A bowl of mild herbed gravy came on the side, but I found it extraneous. What was on the plate was perfection — one of the best things I’ve eaten in the last 12 months. Desserts were not quite as exciting. I was jazzed to try the churros, which were endearingly served in a paper cone made from a Seven Days book review. Rather than the classic extruded wands, the fried sweets were doughnut hole-shaped, which turned out to be less than ideal for eating in more than one bite. Though the flavor was great and the texture perfect, the little balls simply crumbled when bitten. Too bad — the deep, dark chocolate and caramel sauces on the side were wonderful. The baklava was difficult to eat, as well. The top layers of phyllo were soft from excessive butter, while the lower reaches of the pastry were too rigid to cut with a fork. The caramel sauce on top lent a unique flavor to the dish, but my sensitive jaw made it not worth the effort. My dining partner disagreed — he was thrilled to take home the second half of the giant serving. 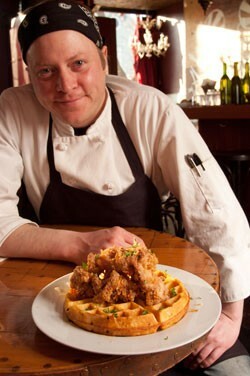 During his tenure at the Bluebird, Wade perfected a home-style cuisine of preserves and comforting, fatty goodness. After two meals at ¡Duino! (Duende), my conclusion is that he’s brought that style with him and melded it with equally enticing ethnic tastes. Greater Burlington has a good new source for flavorful Middle Eastern fare in a relaxed setting. As for me, the Cubano and chalupas are calling my name — Wade has a background in Latin cuisines. So is the chicken and waffles. In fact, if you go to ¡Duino! (Duende) tonight, you may see me moaning as I down another plateful. All part of the place’s quirky color.